About 150 people have been treated in hospital and hundreds more affected by an unknown gas which hit the East Sussex coast. Birling Gap beach was evacuated on Sunday after people reported breathing difficulties, stinging eyes and vomiting when a "mist" appeared. Sussex Police said on Monday morning the gas cloud appeared to have cleared. Agencies are investigating the cause and have not ruled out either on-shore or off-shore locations. In the past, chemicals have drifted across from European industrial units, but Sussex Police said: "Weather models suggest that an onshore source in northern France is very unlikely." The Coastguard said it was working with its French counterparts and looking into vessels that were in the area at the time. East Sussex Fire and Rescue Service said it was "extremely unlikely" the substance involved was chlorine. Beaches in the area were open as normal on Monday and thousands were expected to flock to the coast as temperatures reach up to 25C (75F). Jonathan Hill, 28, who lives close to Birling Gap beach, said people had begun arriving at the beach on Monday although "it's maybe a bit less busy than usual". He said he returned from holiday with his girlfriend at about 16:30 BST on Sunday and immediately began to suffer. He said: "We got home, threw open the windows to air the house and quickly developed stingy eyes. At one point I couldn't see for about five minutes." Bob Jefferey, of the Royal National Lifeboat Institution (RNLI) Eastbourne Division said: "Whatever it was, it smelled like burnt plastic. "It hung about and didn't move yesterday because there was no wind." The first reports on Sunday came in from Birling Gap, between Eastbourne and Seaford, just before 17:00 BST where people reported having irritated eyes. The plume of gas moved eastwards along the coast as far as Bexhill, police said. Coastguard rescue teams from Birling Gap, Eastbourne, Bexhill and Newhaven raced to help clear the busy beaches as visitors feared they had been struck by a chlorine leak. 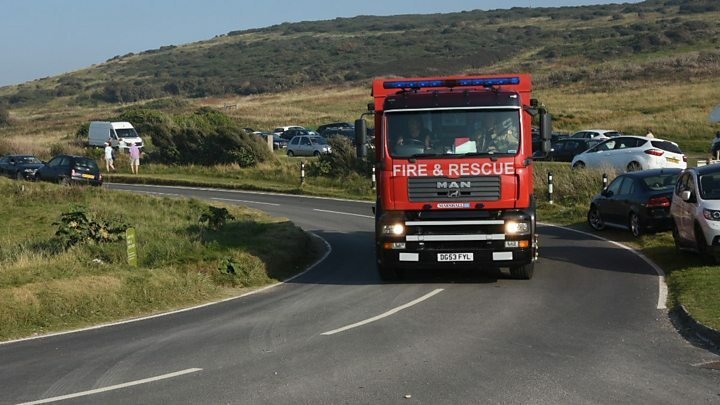 Image caption Police, fire and ambulance services raced to the scene after reports of a "chemical haze"
Roy Page, from East Peckham, Kent, was on the beach at the time when what appeared to be a sea mist rolled in from the west. He described it as a colourless, odourless, mist that was "seriously painful on the eyes". Kyle Crickmore, who was at the Birling Gap beach with his family, said it emptied within 10 minutes after people began to feel unwell. "It was definitely out of the ordinary considering it was a nice, clear, sunny day 10 minutes beforehand," he added. "It was stupidly busy and it was a boiling hot day. "It emptied in about 10 minutes, which was quite staggering considering the amount of people who were there." Long queues built up at Eastbourne General District Hospital well into the evening, with approximately 150 people being treated, East Sussex Healthcare NHS Trust said. "Initially, patients were dealt with as a precaution with a full decontamination treatment, but it became clear that this was not necessary, following clinical advice," a spokesman said. Members of the public alerted emergency services, which triggered callouts to the UK Coastguard, Sussex Police, South Eastern Ambulance Service and East Sussex Fire and Rescue Service, who said they were treating it as a "chemical incident". People were advised to wash their eyes if they were irritated and to wash all over with plenty of soap and water to decontaminate their bodies. East Sussex Healthcare NHS Trust added: "If you were affected and after taking the precautions recommended you still feel ill, contact 111 for advice and only visit your local A&E if you are still suffering significant effects." Police said it was believed that this was an "isolated incident and is not expected to recur". Eastbourne councillor Kathy Ballard said: "We need to find out the cause, where did this come from, and to make sure that steps are taken so that it does not happen again. "I have not heard of it happening before in this area."